I LOVE the Christmas Holidays! My favorite time of year is Christmas (Despite the cold weather here in Utah)! I want to share with you a Christmas tradition that my family does since they moved here to Utah.My dad is half Greek and half Hispanic as far as his ethnicity goes. My mom is a blond-haired blue-eyed bomb shell from California. Together they make a fantastic duo. My mom is a FABULOUS cook and my dad has FABULOUS foreign recipes from his dad and mom. Combine those two amazing assets and we had some of the best food at our home!Every Christmas Eve, to add a little extra spice to our holiday, we have a Mexican Feast filled with AMAZING Mexican food!…Tamales, Homemade Refried Beans, guacamole, burritos, dip, chips and salsa…you name it its probably part of our dinner! This year, I was asked to bring an appetizer, so I have been experimenting fun twists on “Mexican” when I came across this recipe! Though it is not authentic Mexican food, it sure has similar flavors and I think it will be a smash hit at our party! Preheat oven to 425F. Line 2 baking sheets with aluminum foil and spray lightly with cooking spray. In a large bowl mix together corn, beans, spinach, cheese, chiles, onions, cumin, chili powder, salt and cayenne pepper. Using a small spoon, scoop a small amount of filling onto the wrapper. Starting at a corner, carefully start to roll the wrapper. When it’s slightly rolled, tuck in the two side and continue rolling to the last point. Wet your finger with water and dab a bit on the corner to seal the egg roll. Repeat with remaining wrappers and filling, placing them slightly apart on the baking sheet. Lightly spray the tops of the egg rolls with cooking spray and bake for 15-20 minutes, flipping them at least once during baking. Place all ingredients in a blender and pulse until smooth. Use immediately. The avocado ranch looks great. so funny you blogged about that recipee. I am making it today!!! Can't wait to bite into these! I'll be getting the ingrediants today! What a unique and delicious way to celebrate Christmas. :) I wish you and your family a Merry Christmas filled with love and blessings! What a great recipe for this time of the year! They sound amazing. Thank you for sharing. I love this! 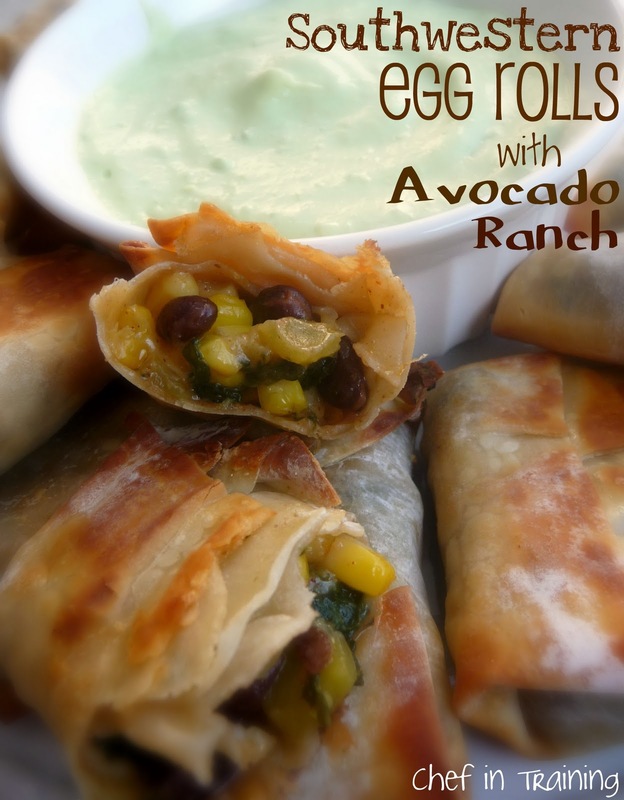 I love Southwestern Food and and I love that you baked the egg rolls, and not fry them! I need to do this, I have some wrappers in the freezer. oh bestill my heart -- this is a vegetarians dream dish! thank you so much for sharing and i do believe this will be made this week!!! thanks so much!!! holiday hugs to you and yours! Those look so good!! We would love these! Thanks for sharing the recipe. Oh wow. These sound great! Sure they will be a hit! I'm making these for my family on Christmas day! We decided to have tex-mex this year instead of the traditional turkey. This will be the perfect starter! I made these for our Christmas Eve family gathering!! they were amazing! Prep time was very minimal! They were gobbled up by everyone. They made plenty! The bake time was right on at about 15 or so minutes! Great recipe. Prep time not needed as it didn't take long at all! Thakns so much for sharing the recipe!! loved it all around! This looks and sounds so yummy! I'm going to have to make these! oh my gosh these look good! I've never used eggroll wraps before... I'll have to try it out! I made these today and they were wonderful! I love Chili's Southwestern Eggrolls and now I don't have to go out to get them! A+++++++! These look sooo good, I can't wait to try them! Thank you. I hope your family loved them as well! I saw your recipe pinned on Pinterest and tried it last night. FANTASTIC!! Everyone liked it including my two picky teenagers! I also was a fan of the Chili's version but feel much less guilt making them myself because I know what's in them! Thanks for sharing! Im a server at chilis. Their eggrolls are my favorite appetizer. and this recipe looks pretty dead on. even the avacado ranch. BTW: our avocado ranch is just chilis regular/basic ranch with fresh avocado pieces stirred in. thats all there is to it. its way good though. i just made these and i am eating them as we speak! they are soooo good! the eggrolls at chili's is my favorite item and this taste dead on! with the avocado ranch i blended in some ken's ranch because i wanted a more ranch taste than straight up avocado. sooo happy with this recipe! These look amazing! I have 2 questions, 1. can I use fresh spinach in place of frozen? 2. Can these be built ahead and frozen? Thank you, I love your site! YUM YUM YUM!! THANKS FOR POSTING THIS RECIPE...IVE PRINTED LIKE 10 OF YOUR RECIPES AND iVE ONLY JUST BEGUN! !